Well, watch for ‘Splody Heads on The Left. This entry was posted in Economics - Trading - and Money, Emergency Preparation and Risks, News Related, Political Current Events and tagged Caravan, City, Tent. Bookmark the permalink. 11 Responses to Catch And – Hello Tent! I really appreciate the hard work our President does for our country. He works tirelessly to ensure justice and our existing laws are applied fairly all with little help. He had held his line against forces trying hard to thwart his every efforts, and generally succeeded in most cases of getting the work done to ensure his promises he ran on are instituted. He far from being a perfect man; but that also makes him very human. His actions speak volumes as he constantly battles those who come up against him and usually wins. I chuckle at the way he wrestles with the forces fighting him. He’s still my modern day hero. The FUD is Strong in them!… Watching ABC News this morning, they have a few snips from the above speech. They have intercut it with Fear Uncertainty and Doubt hand wringing nay saying Talking Heads. Just Amazing. Loads and loads of “he can’t”, “It’s illegal”, “More lies!! !”, “General says otherwise”, etc. etc. Some of it is clear “deliberate misunderstanding”, some is “prior bias – unchecked” – like when they say the law prevents using the military domestically – same thing I thought – but didn’t bother to look into the law and discover that just isn’t so. Then there is the “edit for spin effect”, and the “talking dirt” insults. Just so predictable. The YSM gave candidate Trump loads of unfiltered coverage up through the Republican Convention. They wanted Trump to be the candidate to face Her Royal Thighness because they thought he would be the easiest candidate for Cankles to beat. That early coverage piqued the interest of the voters and after Trump won the nomination, the press went full on negative against him. Too late. The internet and social media allowed candidate Trump to get his message out in spite of the efforts of the YSM and the rest is history. Promises Made and, despite the best efforts of the YSM to hide it but thanks to the internet, we know there are a whole lot of Promises Kept. Other than perhaps the delusional YSM itself, no one has claimed that jurinalists (Swedish pronunciation) are the smartest people in the room. Some additional information on the background of this problem, how the folks coming in and the immigration lawyers are intentionally gaming the system to over burden the process and force release of immigration applicants due to long delays to get through the court system. Just the 28 second video clip of the President’s comments on rock throwing and treating them as if they were firing shots from a firearm after the violent breech of Mexico’s border and injuries they caused to the Mexican police and border agents when they broke into Mexico. President Trump spoke about asylum seekers at an immigration press conference at the White House on Thursday. This decision blows the 9th Circuit Court decision out of the water that has been a center point of intentionally over loading the immigration system. In the 5-3 ruling, the justices also took a dim view of the kinds of class-action lawsuits on behalf of immigrants that have become a key tool for anti-Trump immigrant rights activists, leaving the activists worried about the fates of other cases winding their way through the lower courts challenging President Trump on issues such as illegal immigrant Dreamers and Iraqi deportees. The ruling was also a rebuke by the high court to the U.S. Court of Appeals for the 9th Circuit, which had its decision overturned. Justice Samuel A. Alito Jr. chided the 9th Circuit for ignoring the text of immigration laws and creating a legal standard for bail hearings “out of thin air” by requiring that immigrants be given periodic bail hearings. “Spotting a constitutional issue does not give a court the authority to rewrite a statute as it pleases,” Justice Alito wrote for the majority. The complex case has been percolating through the courts for years, based on a challenge first brought by Alejandro Rodriguez, a Mexican national who has been in the U.S. as a lawful permanent resident since 1987. The government tried to deport him in 2004 after several criminal convictions. Mr. Rodriguez fought deportation, but the government detained him during that time. He sued, arguing that under the detention law he was entitled to a bond hearing that could result in his release. The lower courts established a class action for Mr. Rodriguez and other immigrants being similarly detained, and ruled that they were entitled to bond hearings after six months and periodically after that. The lower courts said the law could be unconstitutional otherwise, based on a 2001 Supreme Court ruling that mandated release of immigrants whose home countries refused to take them back. Justice Alito, joined by Chief Justice John G. Roberts Jr. and Justices Anthony M. Kennedy and Neil Gorsuch — and to an extent, Clarence Thomas — said that amounted to a wholesale “rewrite” of the law. They sent the case back to the 9th Circuit for another review consistent with their ruling that the law doesn’t require bond hearings for all immigrants in detention. Immigrant rights groups said they will continue to fight as the case goes back to the lower courts and will argue that the law is unconstitutional if it doesn’t allow for bond hearings. They got backing Tuesday from the dissenters, led by Justice Stephen G. Breyer. He wrote that the country’s core liberty rights have always included the chance to challenge detention by seeking bail. “The bail questions before us are technical but at heart they are simple. We need only recall the words of the Declaration of Independence, in particular its insistence that all men and women have ‘certain unalienable Rights,’ and that among them is the right to ‘Liberty,’” he wrote. Justice Breyer said the majority decision appeared to eat into a key 2001 Supreme Court precedent, the Zadvydas ruling, which established a six-month maximum on detentions in cases in which the government is trying to deport immigrants but their home country won’t take them back. Detention applies to illegal immigrants caught at the border and inside the U.S., and to legal immigrants whose criminal activity has made them eligible for deportation. The biggest effect of Tuesday’s ruling could be on the surge of migrants who have shown up on the border in the past few years demanding asylum. Their numbers have swelled as smugglers have taught illegal immigrants to use “magic words” claiming fear of being sent back home to get on the asylum track. The Trump administration has argued that it should be allowed to hold them while their cases proceed — hoping that it will tamp down on bogus claims. Analysts said the Tuesday ruling appears to give the administration broad detention powers in those cases. ‘The answer is simple, because nothing trumps sovereignty. Therefore, for anyone who breaks into our country without consent or overstays the terms of his or her entry, it’s as if they are physically not present on our soil. Constitutional rights on our soil, much less the ultimate prize of citizenship, only apply if you come here with consent. That is deeply rooted in social compact theory and settled law. As the court said long ago in United States v. Ju Toy (1905), a person who comes to the country illegally is to be regarded as if he had stopped at the limit of its jurisdiction, although physically he may be within its boundaries. Already as far back as the 1950s, the Supreme Court had already said, “For over a half century this Court has held that the detention of an alien in custody pending determination of his admissibility does not legally constitute an entry though the alien is physically within the United States.” Leng May Ma v. Barber, 1958. Military is putting up razor wire concertina at the border. Good training exercise if nothing else. Well, they got part of it right… “Catch & release” is over. As noted somewhere (can’t fine the comment now…) IF Trump declares a Martial Law zone at the border this goes under UCMJ (10) not the regular US Civil code. 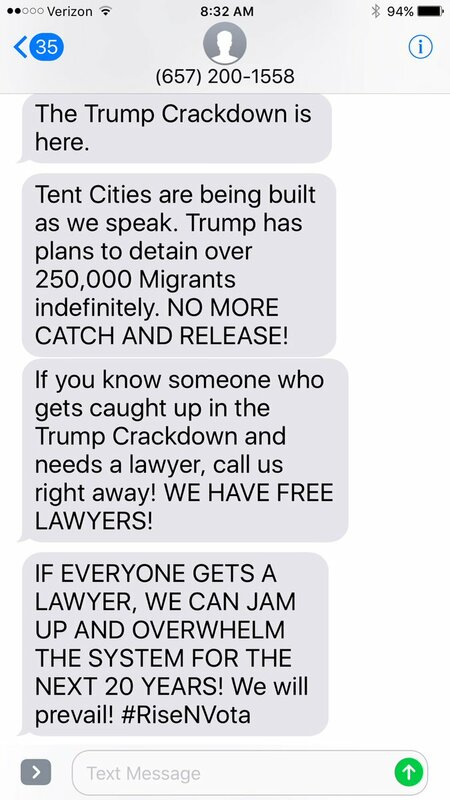 Don’t think those lawyers are going to be much use… and I’m pretty sure UCMJ is designed to handle large masses of “refugees” without a lot of court time / head.